There are many people talking throughout the game industry and community that the abundance of social games, casual games, first person shooters, and other multi-player games are the plague of the industry. While I can see why people think this because the market is flooded with these type of games right now. I however feel quite the opposite of what these people feel. I don't understand how a demand for games or a certain type of game can be a plague. I see it as simply what people are willing to pay for. So instead of blaming those games why not find out the reason why these games are highly sought after or at least try to. My theory and this is primarily based on me and a few others with similar interests is price and or bang for your buck. If you think about most social games they are fairly cheap if not free. For the growing amount of casual gamers who might not want to invest a whole lot into buying games this is attractive to them. They still get to enjoy themselves and not break the bank at the same time. If you look at multi-player side of it it's more bang for your buck. Most multi-player focused games will have a single player campaign short or long, some with online co op, and many modes of multi-player. This will give the average user at the least three weeks of play time most of the time more. You take that vs a single player only game which most users finish in a weeks time if not less put them at the same price point and you can see why in most cases the multi-player game will be the choice. That's not to say that these games are better or worse then other forms of gaming but if you look at the trends in sales social games and multi player games sell the most. The reason for this is (my opinion) because people want more bang for there buck now. Most single player only games can be beat with a rent so what's the purpose of buying it? There is none other than the fact you might be a fan of that game and want to add it to your collection. So these types of games aren't the problem it's the price point that is. I personally will pickup a game that has single and multi-player in it before I buy a game that just has single player at the same price point. Also buying a game at a $.99-10.00 price point I won't even think twice about it. There are a lot of games I would have purchased rather than rent had the price been lower. Take for instance God of War 3 vs Uncharted 2 both 60 bucks at launch, both great games. For me the game that would give me more bang for my buck would be Uncharted 2. GOW is single player only I beat it in about give or take 3 days. What to do now with the game other than play it again and try to get all trophies? Not a trophy hunter that part of gaming means nothing to me. So basically this game is done for me now. Uncharted has both single player and multi-player. Single player give or take I beat in the same time, then I can go to co-op that can be another day or two, then you have various modes of multi-player that can keep you entertained for weeks if not longer. This is not saying one game is better than the other this is strictly showing you that one game offers more for the same price than the other. So why should they be the same price? This is also just one comparison of many and opinions may vary but I feel that pricing needs to be rethought for games and this is the real plague in this industry. People want more bang for there buck or a cheap thrill and I don't think its going to change anytime soon. 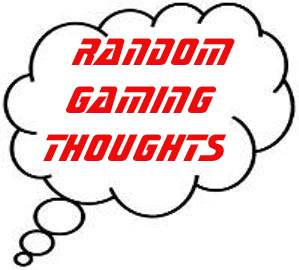 This has been another Random Gaming Thought and thank you for your time, and let me know if you agree or disagree and why in the comment section. Current example of this is brink. its a cool game but its just not a $60 game.